If you came across a set of instruments left out on the street, would it possibly inspire you to commence some impromptu busking and free the busker inside of you? It does for these Londoners who happened upon a selection of musical instruments while out for a walk on London's Southbank, a place well known for its buskers. Things starts off tentatively with a few people dipping their toes in, playing around with the equipment and having a bit of a laugh with it. As many people might, they give in to curiosity. But then, the talent truly arrives and the improv busking starts to level up when a capable pianist begins tinkering away. He's good, very good. 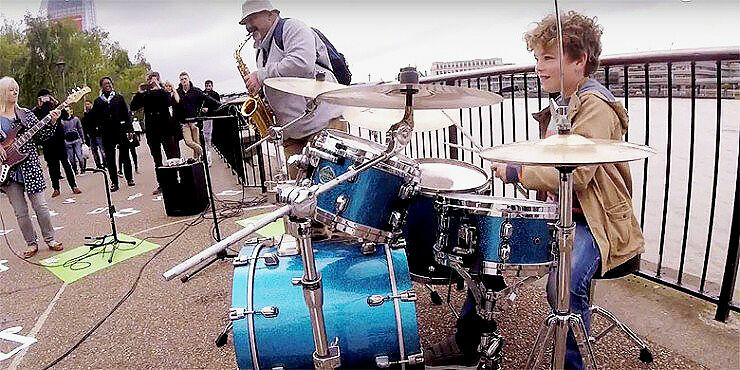 But what really gets the crowd gathering is when a young kid runs up and then sits down at the drum kit, and starts banging out a funky rhythm with complete assurance and skill. Before long this impromptu busking jam session has hooked a guitarist, a saxophonist, a rapper, and a harmonica player. The band is back together! And with this type of musical flair it's no wonder a crowd has come out to see what's going on and listen to the amazing busker band, phones out too of course, to soak up this one-of-a-kind busking treat. Is This Amazing Busking Band For Real? Well, all is not quite as it might seem. 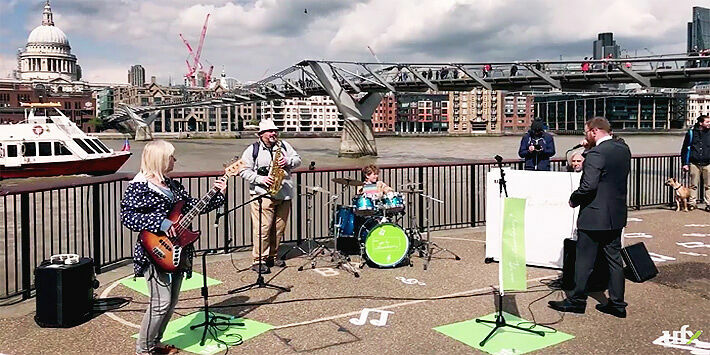 Because this seemingly spontaneous gathering of an impromptu busking band jam session is actually a very clever video and the brainchid of London-based viral agency TVF. The idea behind their video is to highlight an online trading platform for their client UFX in that 'anyone can have a go', and that ordinary people are capable of being extraordinary given the right circumstances. It's a clever connection, UFX's online services provide a simple, user friendly platform which is open to anybody (provided of course you have a £50 minimum deposit). So if you wanted to try your hand at some easy-to-use online trading in a safe environment with awarding winning trading tools, then UFX will be happy to welcome you. Meaning, just like this array of musical instruments: anyone can have a go. Find out more at UFX's website.